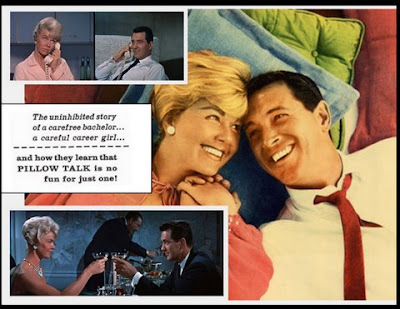 PILLOW TALK was one of the top-grossing features of 1959. The first pairing of Doris Day and Rock Hudson clicked like a key in a lock. The movie started a string of "bedroom comedies" which would continue into the mid-1960s. Doris and Rock would make two more together...LOVER COME BACK and SEND ME NO FLOWERS. Doris made several others without Rock, and Rock the same sans Doris. Then came others in the genre featuring such stars as Cary Grant, Bobby Darin, Sandra Dee, Robert Goulet, Andy Williams, Rod Taylor, James Garner and Gina Lollobrigida. The first Rowan County engagement of PILLOW TALK was ten days. The CENTER THEATRE was fortunate to be able to keep their print of the movie that long. Other towns weren't that fortunate. Statesville, N.C. was booked a print for only four days. In order to accomodate the crowds who wanted to see the movie there, the Statesville theatres "bicycled" their print back and forth between the two downtown movie houses, staggering starting times every hour, for the four days.